On my Shinfield walk a few weeks ago a few of us discussed the possible origins of the Thames Valley group. 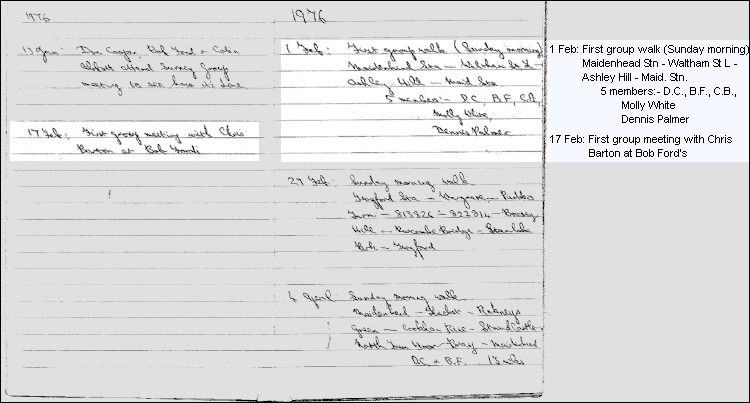 What I know comes from meeting Bob Ford a year or so ago, when he handed me a note book that recorded the first TV walk on 1st Feb 1976, followed by the first group meeting on 17th Feb 1976. The founding members were Don Cooper, Bob Ford, Colin Abbot and Chris Barton. I’ve scanned the pages from Bob’s notebook so you can have a look for yourselves. Obviously we missed out on the 30th anniversary, so maybe we could go for a 35th in a few years!